John Kerry rose to the occasion Thursday night. Giving the best speech of his campaign for the presidency, he successfully and concisely defined himself as a man of character capable of leading the nation in a time of war. If the goal of an acceptance speech is to introduce a candidate positively to voters who may have only a vague sense of them, Kerry did it. By attacking Republicans where they have been historically strongest – security, "family values" and faith – he made tangible steps toward establishing the issues as Democratic in belief, a central strategy of the Kerry campaign. With 17 mentions of the words "strength" or "strong" and 16 mentions of the word "values," the message Kerry attempted to get across was that as a Democrat he can defend a nation and morally embody it as well. It was the standard bearer of the Democratic Party reclaiming issues they lost decades ago. 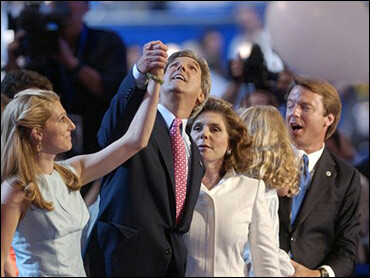 "This speech was the best John Kerry has ever done," said Louisiana Sen. Mary Landrieu, yelling over the noise of the convention floor, the hall covered in balloons, Van Halen blaring. "We are so energized by this man," she continued. "You hear Bill Clinton speak and you think how great he is. Tonight, when John Kerry finished speaking you looked around and said how great we are. It was just magnificent." As evidence of the speech's impact on the Democratic base, the Kerry campaign announced at midnight that it had raised $5.2 million on Thursday, breaking the record of $3 million they raised the day before. Other speeches had brought more people to their feet in Boston's FleetCenter, but there was a sense among those in the packed convention hall that a serious address was suitable. More importantly, the sense among experts was that outside the arena, in the America where 46 percent do not have a clear view of the Democratic nominee, Kerry successfully defined himself and may have reached undecided voters. "I think finally today the Kerry campaign began to paint who this guy is and he could have well have made some significant headway in reaching those undecided voters," said Stu Rothenberg, editor of the nonpartisan Rothenberg Political Report. "He made people comfortable with John Kerry as president of the United States, as commander-in-chief." The speech showed John F. Kerry modeling himself on his political idol, John F. Kennedy. Mentioning Kennedy's "call to service" early in his address, his voice rising as he tapped the podium, Kerry appeared confident, invigorated by the audience from the outset. Like the first Catholic president from Massachusetts, Kerry emphasized his military experience in vivid detail, spoke optimistically about America, stressed fiscal responsibility and above all, spent nearly a third of his address attesting that he is a most capable commander-in-chief. Listing anecdotes of struggling Americans, he told the audience six times that "help is on the way." Matching the theme of "hope is on the way" utilized in last night's address by running mate John Edwards," Kerry mostly used the plain language and sound bites that his party had hoped to hear. After four days of the Democratic National Convention almost myopically focused on Kerry's national security credentials, he finally spoke directly about his experiences in war. America never goes to war because we want to, we only go to war because we have to." Speaking of his days commanding a swift boat in Vietnam and obliquely contrasting himself with President Bush's avoidance of service overseas during the war, Kerry proclaimed, "I will wage this war with the lessons I learned in war." The central tenet of Kerry's criticism of Mr. Bush's handling of the war in Iraq is that the U.S. military is overly committed because our traditional allies have been estranged by a belligerent policy. By not saying the more than 800 U.S. fatalities in Iraq did not have to occur – as many delegates on the floor believe – Kerry avoided the overt attack on the president many Democrats had hoped to hear. "He is speaking to the undecided voters, the anti-Bush is so strong, he can take almost any position and he still has Democrats," said Merle Black, a professor at Emory University in Atlanta who spoke by phone from his home. "He looked good. He looked really energetic, relaxed and confident," Black said of how he appeared on television. "At some point he needs to say 'If you are going to replace the guy, what are you going to be that is different? But I think most people who saw him for the first time would have a favorable impression and it was wise for him to not directly engage the president."